From time to time, I like to share a few of my favorite photos with random observations, travel tips, and anecdotes. This batch of “postcards” is from last September, when I visited the Greek islands of Santorini and Mykonos, working on the fifth edition of our Rick Steves Greece guidebook. 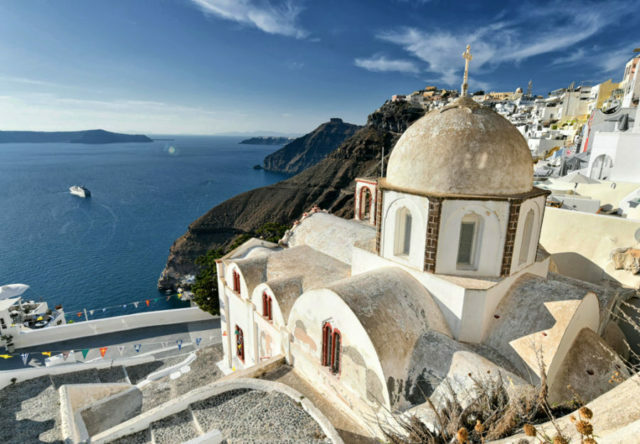 Santorini is famous for its glorious caldera — the faint echoes of a volcano crater that erupted, then filled with seawater, millennia ago. Today cruise ships huddle in the center of the caldera and tender their passengers to shore. This view is from the terrace at Venetsanos, one of many wineries that take advantage of Santorini’s unique volcanic composition. 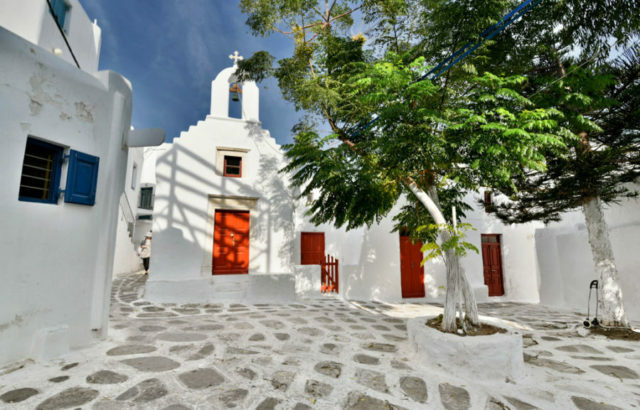 (Before tourism, the Vinsanto — “holy wine” — produced here kept Santorini’s economy afloat, as it was exported for Eucharist purposes to Orthodox churches across Russia.) It’s fun to drive around Santorini, stopping in for tastings at your choice of wineries (our favorites are listed in the Rick Steves Greece guidebook). But if you want to come at sunset to enjoy this view with your wine…book ahead! 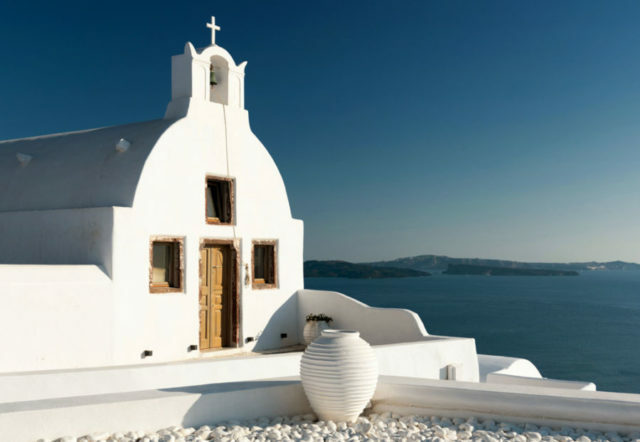 Santorini has many classic views, with cute domed churches against a caldera backdrop. I had an excellent local guide — Kostas from Santorini Private Tours — who helped me write new self-guided walks for our guidebook of both the main town, Fira, and jewel-box Oia. With Kostas’ help, I have a new appreciation for how to tell the difference between a Greek Orthodox church and a Catholic one (built by the Venetians who settled here after the Crusades, and gave the island its international name: “Santa Irini”). This one’s Orthodox. Santorini’s main town, called Fira, is a gauntlet of souvenir and jewelry shops (and an odd abundance of “fish foot massage” places — a phenomenon that originated in nearby Turkey, and has caught on here with a strange vengeance). In this vertical village, most lanes come with steps — which are helpfully painted with directions to the cable car, whisking cruisers to and from the old port. Despite its touristy nature, I enjoy losing myself in Fira’s lanes. 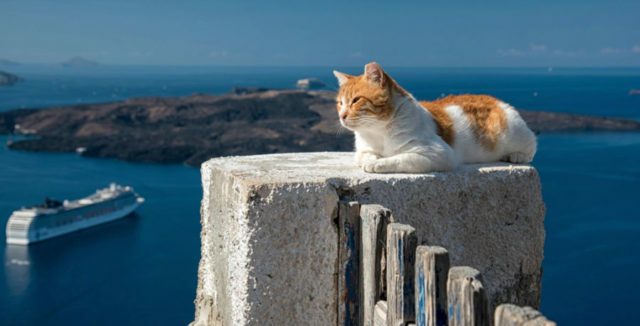 All over Greece, it seems like cats are posing for pictures. I swear the Santorini Tourist Board plopped this one down on his perch moments before my guide brought me around the corner for this spectacular caldera view. 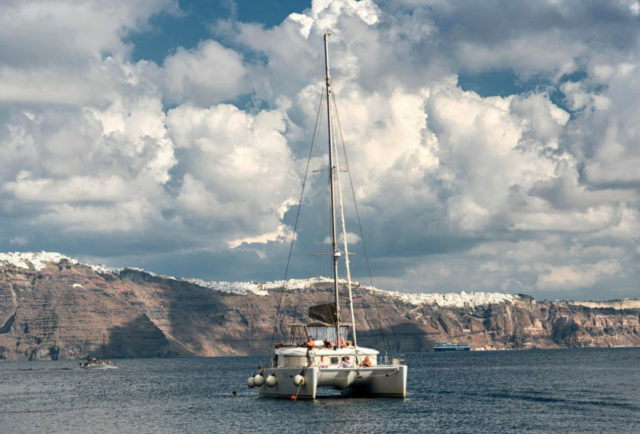 One of my favorite Santorini experiences was the sunset catamaran cruise I enjoyed with Caldera Yachting. The trip included a big, swanky boat with all the amenities; a fun-loving but professional crew dedicated to creating a memorable experience; an excellent meal of traditional Santorini cuisine; a few opportunities to go for a swim from the boat; easygoing and enjoyable fellow passengers; and perfect positioning for viewing the sun dip slowly into the Aegean. There are cheaper options offering a similar experience on a packed tourist boat, but I found the catamaran trip to be a worthwhile splurge. 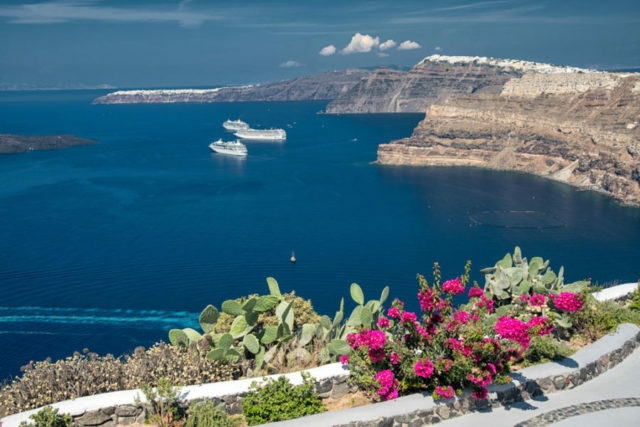 The village of Oia — at the far tip of Santorini’s main island — is one big postcard, with its whitewashed houses and churches huddled along the caldera cliffs. Everyone (and I mean everyone) comes to Oia for the sunset. A half-hour before, its narrow lanes are a human traffic jam. I came in the late-afternoon, enjoyed the views and the rich sunlight, did my work, then hopped in my car minutes before the sunset. A few miles down the road, I pulled over at a stunning roadside viewpoint, which I had all to myself. Greek islands are connected by speedy catamarans. On my journey from Santorini to Mykonos, I had to resist the urge to hop off at each idyllic island we stopped at. Ios — which struck me as a sleepy, less glitzy alternative to the big-name islands on my itinerary — was particularly tempting. I’ll be back. 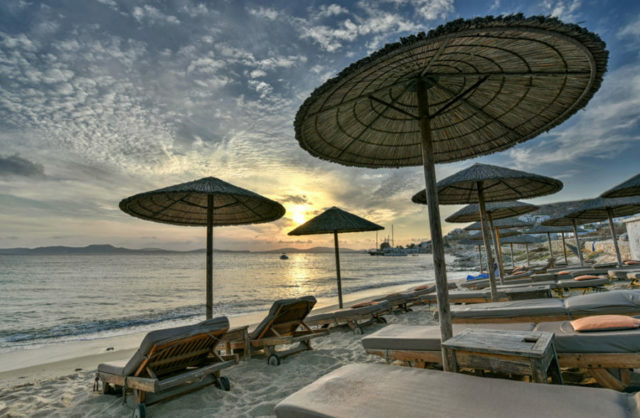 Mykonos is a breathtaking little fishing village that’s been transformed into a bucket-list stop for the jet set. 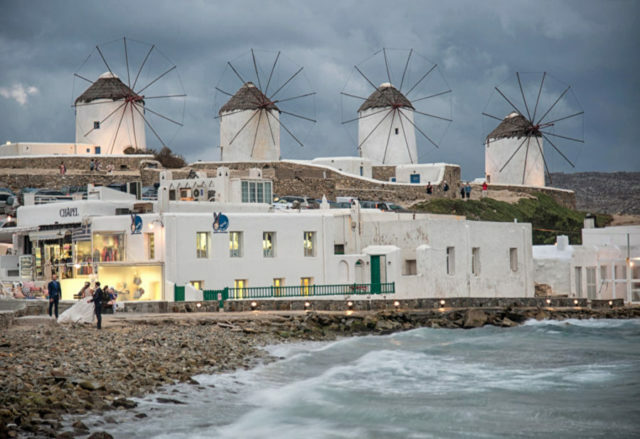 I love Mykonos itself, but was a little put off by many of the upscale, snobby-seeming tourists I met here. Still, I can’t resist this town’s whitewashed beauty. 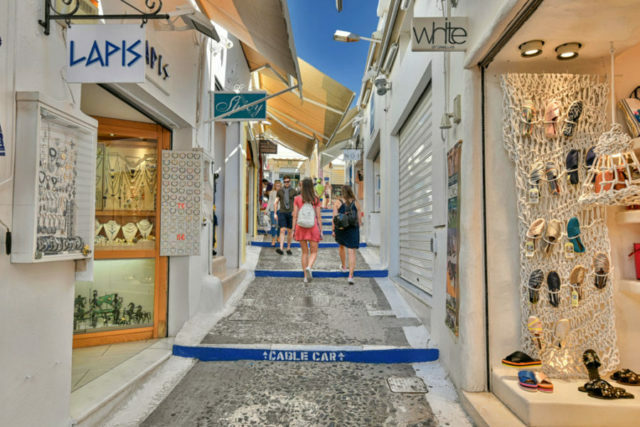 Even on a crowded day, it’s easy to lose yourself in Mykonos’ back lanes. Everything is painted a blinding white, including the seams between the paving stones. Today this is decorative, but originally it was practical: By painting the lanes with lime — a natural disinfectant — Mykonians offset the unhygienic living conditions (people living on top of each other, and emptying their chamber pots in the streets). And the rooftops were painted with lime, too — they collected precious rainwater, which was carried through a network of gutters to cisterns down below. (Fresh water is hard to come by on an arid island.) 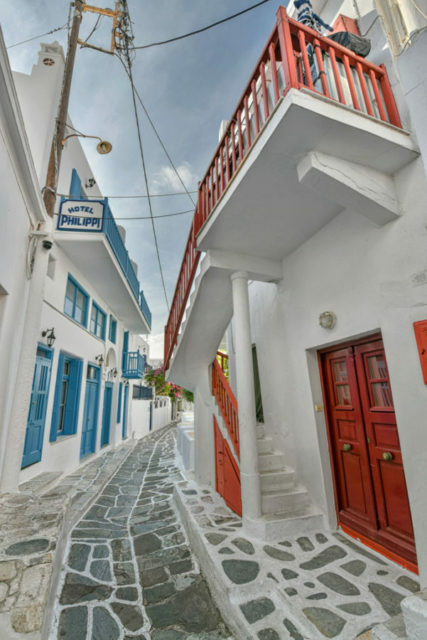 Today the doors, staircases, and trim are painted bright, cheery colors, giving Mykonos its distinctive look. Like on Santorini, I had the help of a great guide — Antonis Pothitos — to write a self-guided walking tour of Mykonos town for our guidebook. Antonis took it as a personal challenge to get me lost in the twisty lanes — to prove the value of having a live tour guide. I took it as a personal challenge to disentangle everything he showed me, then to organize it and write it up in a way that even a guide-less novice could follow. 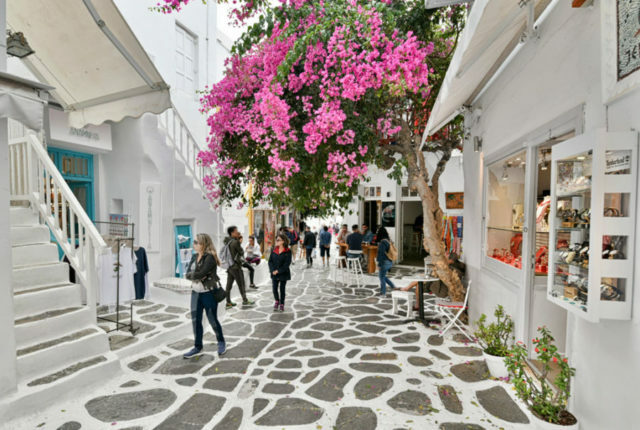 You’ll have to try the walking tour to see if I succeeded…or if Antonis is correct that you really shouldn’t attempt touring Mykonos without a guide. Antonis isn’t just looking out for his livelihood. Mykonians embrace their crazy street plan as a matter of civic pride. It’s not just atmospheric, it’s practical: The randomly angled and gnarled lanes help break the howling winds that famously swirl around the island, and the crazy street plan makes it all but impossible for would-be invaders to find their way around…unless they’re toting a good guidebook. 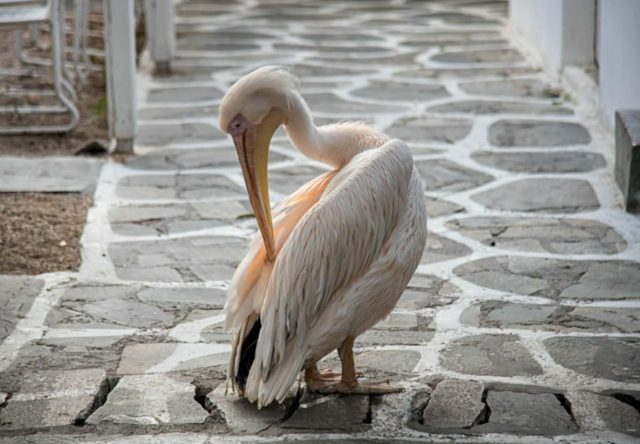 Mykonos’ most famous inhabitants are its three resident pelicans: Petros, Nikolas, and Irini. Because every visitor is on the lookout for these three birds, normally you’ll spot them being followed around by a chaotic scrum of paparazzi tourists. One afternoon, as I was wandering the back streets of Mykonos (desperately trying to make sense of Antonis’ tour), I stumbled upon one of these pelicans all by himself in a quiet courtyard. My breath caught in my throat as I found myself alone with this surprisingly majestic bird. As if recognizing a celebrity desperate to remain incognito, I exchanged knowing glances with the pelican, gave him a nod of respect, and quietly moved on — leaving him with a rare moment of privacy. 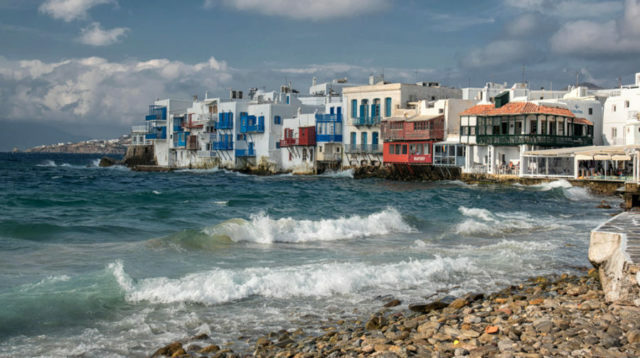 Mykonos’ most famous corner is “Little Venice,” a row of former sea captains’ residences that rise up from the water. It’s the perfect place to enjoy the sunset while looking back over the town’s other claim to fame — its five windmills on a ridge (perfectly positioned to harness that legendary wind). Skeptical, I invested $20 in a cocktail here…and was very glad I did. As there are basically no sights worth paying to enter on the island, consider this your “experience budget” for an hour of relaxing with a fine view. 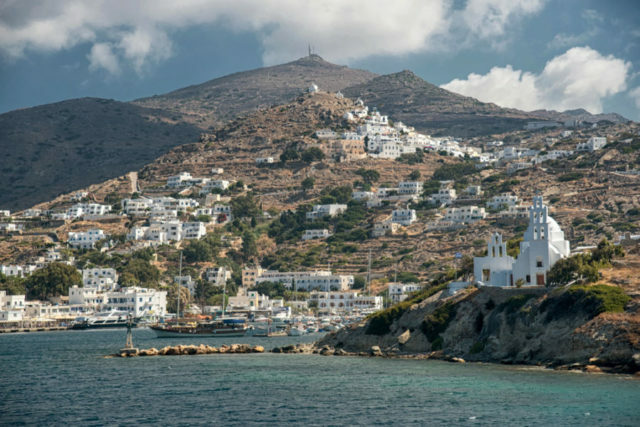 If — like me — you find Mykonos town a little too crowded, snooty, and overpriced, it’s easy enough to escape. From the bus stop at the top of town, cheap buses fan out to beaches all over the island. It’s a breeze to master the system and beach-hop to your heart’s content. Each beach has its own personality, which we’ve outlined in our Rick Steves Greece guidebook — or you can get tips from a local. 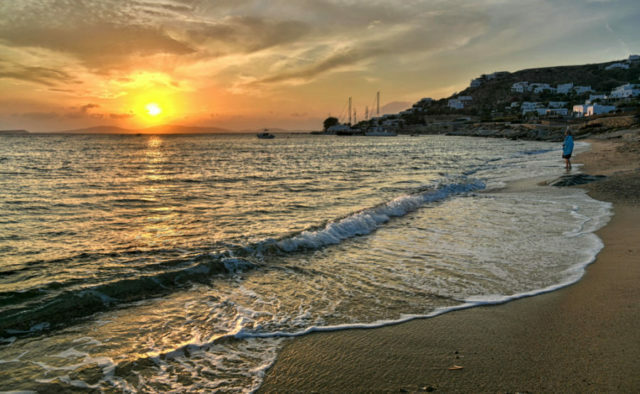 Late one afternoon, I found myself on one of my favorite beaches — Agios Ioannis (known as the filming location for Shirley Valentine) — while it was still sunny and pleasant, but after most of the beachgoers had gone home. I appreciated having this sandy paradise to myself for a little while, and watching the sun set over the Aegean. Rick Steves was on these same islands just a couple of weeks before I was. He was there filming an upcoming public television special on cruising, and enjoyed summiting the ancient site of Delos (just off Mykonos). All of our best tips appear in our Rick Steves Greece guidebook. Beautiful! We love the Greek islands. Looking forward to your cruise special, do you know when it will be on KCTS? My wife and I spent 2 weeks on Santorini. It was a dream of a vacation. The people were so kind, the scenery magnificent, the food was incredible. We absolutely lived our experience. We stayed in the village of Akrotiri at Kalestesia suites on top of the hill over looking the caldera, into Fira on one side and the Aegean sea on the other. It was an absolute dream. Oh, wow! So excited; going in November! So Beautiful! I wish I could travel with you. Love your show. Greece and the Greek islands were on my bucket list, and, finally, I sailed with the MS Koningsdam to visit Greece and the Greek islands. Santorini is my favorite island. I tell my family and friends that I hope Heaven is like Santorini! Absolutely beautiful, magical!! I am a mature lady of 80 years, and I managed to climb to the top of the Acropolis in Athens. This was a dream come true. I still marvel about this beautiful sight, and continue to question: who were the builders (in every aspect)? I guess we will never know. One of the few questions you had time to answer was from my daughter. Thanks for all your info these many years. My wife and I made that stop at Ios on our way from Mykonos to Santorini. It’s right on the way and so glad we did. Smaller, yes, bit still buzzing in summer. Mylopitas Beach, as perfect as any in Greece, and Club Ios with its casually elegant dinner, music and spectacular setting for the spellbinding island sunsets (we went twice), were highlights. We fell in love with the people of Greece from Athens all the way down through the islands. Just learn (however haltingly) the 4 magic words in Greek (hello, good morning, good evening and thank you) and the heart of the country opens up to you. OPA! My experience in Santorini was very similar. Oia sunset was amazing. Saw it once in the town and twice on boat trips. The day trips on the boat were great. The first one we took was 6 hrs with the dinner and swimming as Rick writes, for only about 65 euros if i recall. I wish I had your guidebook there, though we did have your book in Athens, very helpful. The Akrotiri archaeological dig is fascinating. Great places to visit in Greece. I put it among my favorite places to go Thanks for sharing! We just finished Athens, Santorini and Mykonos. In each of the stops (including Delos!) we used the self guided walking tours and LOVED them! Never got lost and were able to go at our own pace and it felt like we saw everything. Absolutely fabulous. Thank you guys! !